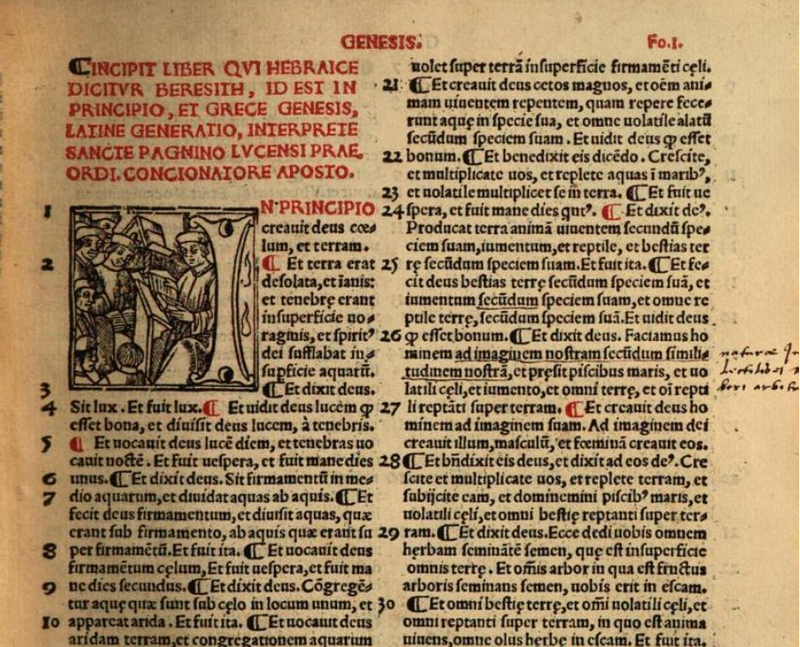 I am very excited about being able to read the Pagninus Latin Bible, 1528, online – many thanks to Mark for putting the link into a comment yesterday! The only other copy that I have seen was printed about a century later, and is located in Toronto. So this copy is much appreciated. The Pagninus Bible is, in my view, the most influential of all Bible translations of the Reformation. Erasmus’ Latin translation of the Christian scriptures was also important, but Pagninus translated the whole Bible. It was from the Pagninus Bible, along with the Vulgate and Luther’s Bible, that Coverdale made the first complete translation of the Bible in English. Click on the image to get a full size version. There are many reasons why this Bible may not be well known today. It stands well outside the Prostestant tradition. Not only was the translator a Roman Catholic, but also a Hebraist and Christian Kabbalist. This edition also includes two letters from Pico della Mirandola to the translator. Della Mirandola was a well-known Christian Kabbalist and humanist. Pagninus himself stayed officially well within the boundaries of orthodoxy. However, his main interest in the Hebrew Bible was that Hebrew was the original language, and therefore of enormous philosophical significance. Cabalists regard the meaning of God’s sacred speech, the Hebrew text of the Bible, as infinite, finding significance even in its smallest particles—not only the divine words but also their letters (which are also numbers) and even the shapes of those letters. The most powerful words are God’s names, the holiest of which, the Tetragrammaton, cannot be uttered; written as YHWH, it is pronounced Adonai, a spoken name like Elohim, Ehyeh, El Shaddai and others used of God in the Hebrew Bible. Other words of great power are the names of the Sefirot, which are unknown, as such, to the Bible; they are names not of God but of aspects or manifestations or emanations of divinity. Pico was the first Christian to treat knowledge of Cabala as valuable. Flavius Mithridates, his most prolific Jewish informant, translated (and mistranslated) thousands of pages of Cabala into Latin for him. Large portions of the Oration, drawing on these texts, are also informed by Cabala in ways that no contemporary Christian could have detected—least of all a Christian who lacked the clues provided by theConclusions. The esoteric intention of Pico’s thought, proclaimed emphatically in the Oration, is the feature that most distances it from the whole project of post-Cartesian philosophy in the West and also from earlier philosophies outside the Platonic tradition. Wishing not just to mystify but also to provoke, Pico succeeded and paid the price of the Church’s censure. Theology, spirituality and philosophy—all in the broadest sense—are the main topics of Pico’s Cabala, which shows (or hints) how God reveals himself in the Sefirot, the divine names and the words of scripture. In the 72 Cabalist theses at the end of the Conclusions, this revelation becomes Christology and Trinitarian theology. From a Cabalist point of view, the Sefirot and the divine names are actors in dramas of theology, cosmology, anthropology and angelology whose major themes are exile, death, atonement and redemption, stories that Pico transposes onto the Christian Trinity, with Jesus Christ, the Messiah, as the saving hero. Certainly Kabbalah was distasteful to Erasmus, Luther and likely many other influential leaders during this era. Many people even today might not welcome this association between an influential Bible translation and the Kabbalah. I took a course in Kabbala on finding this out, and sat down and read the Sefer Yetsirah in Hebrew. I don’t have a spiritual interest in Kabbalah, but I refuse to overlook the important role that rabbinical literature, the Kabbala and Jewish scholarship played in the history of Bible translation, and as predecessors to the Reformation. Flavius Mithridates, his most prolific Jewish informant, translated (and mistranslated) thousands of pages of Cabala into Latin for him. Mistranslated? On purpose, to protect the cabalistic secrets or to mislead the Christian? Or out of ineptitude? See my latest post on Latin abbreviations. There are great resources online for this. I’ve been fascinated by the Reformation Latin Bible translations ever since I picked up a Latin primer in my last year at Secondary School … it seems they were an effort to recalibrate the understanding of the sacred texts ,,, we’re seeing a similar thing happen amongst our Muslim brothers and sisters this present time.